Like many Rocky Horror casts, the Friday Nite Specials cast of Aberdeen, New Jersey has a very rich history, stemming from many different casts and shows over the years. From 1988 to 1992, Rocky Horror played at the Middlesex Mall theater in South Plainfield, NJ, and then moved to Edison in 1992, staying there until 1999. In 2000, the show moved to Woodbridge. In November 2001, audience regular Ryan Wilson joined his friend, Anthony Serino, on cast, and coincidentally, the cast changed its name from Sanity For Today to the Friday Nite Specials. Soon thereafter, Ryan became cast producer and Anthony became cast director. Together, they started to clean up the drug problems in the Woodbridge theater, making their Rocky Horror show a safe place to be. The two also refined what has since become the staple of the Friday Nite Specials show � the pre-show experience. 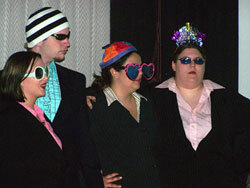 In September of 2003, FNS moved back to the Edison theater, where they began to further refine their pre-shows, consisting of an original comedy skit, emcees, and virgin popping games. After a very successful run while also building their cast further, they left Edison in December 2004 for their current home at the Strathmore Cinema in Aberdeen. Cast director Anthony Serino left shortly thereafter and current director Rick Sullivan, who had come on cast back in Edison days, was elected in June 2006. The Friday Nite Specials are known for their weekly pre-show skits (some audience members who lack the time for the entire show sometimes pay admission just to see the 5-10 minute original comedy skit), outrageous and lively emcees, creative and fun virgin games, and their weekly newsletter. Like most RHPS casts, FNS holds theme nights, including Cast Switch Night, Choose Your Own Death Night, and has held Video Game, Comic Book, and Fairy Tale Theme Nights; they also perform, and sell-out, both Friday and Saturday shows every Halloween. The audience is always a part of the show, and some audience members are as well known as the cast, such as Jersey Rocky Horror legend Jahn Dusenbury. The Friday Nite Specials cast combines the best elements of the Rocky Horror experience: the movie, the cast, the audience... and one hell of a good time.